1. Human trafficking helps corrupt public officials and facilitates other kinds of serious crimes. 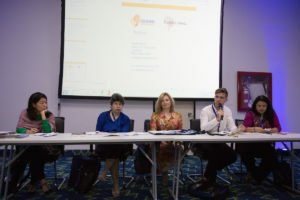 In her presentation at the panel, Dr. Louise Shelley, director of the Terrorism, Transnational Crime and Corruption Center at George Mason University, noted that “very often, human trafficking facilitates relationships with corrupt officials,” which creates an enabling environment for other crimes. She cited a recent report in South Africa where the country’s security minister was linked to a rhino poacher. The security minister, David Mahlobo, reportedly frequents a massage parlor run by a Chinese organized crime network in South Africa. 2. Unlike other crimes such as drug trafficking, there is an absence of political will and lack of knowledge on the laws around human trafficking. This has led to a low response rate in terms of prosecution by law enforcement agents. “It’s easy to see drugs in a neighborhood where it exists, but the same cannot be said about human trafficking,” Dr. Louise Shelley said at the panel. 4. Human trafficking is considered a low risk crime with high rewards. “A human trafficker can earn 20 times what he or she paid for a girl. Provided the [woman] was not physically brutalized to the point of ruining her beauty, the pimp could sell her again for a greater price because he had trained her and broken her spirit, which saves future buyers the hassle.” (Source: FactRetriever.com). 5. Sexual exploitation is only one of many reasons for human trafficking. According to the International Labor Organization (ILO) “an estimated 21 million victims are trapped in modern-day slavery. Of these, 14.2 million (68%) were exploited for labor, 4.5 million (22%) were sexually exploited, and 2.2 million (10%) were exploited in state-imposed forced labor. 6. Human trafficking is among the three most common international crimes, (along with illegal drugs and arms trafficking). An estimate from the International Labour Organization (ILO) in 2005 indicated the number of victims of trafficking at any given time to be around 2.4 million, with annual profits of about $32 billion. Today, forced labour in the private economy generates $150 billion in illegal profits per year. (Source: UNODC). 7. Global human trafficking operates on different levels. Some schemes are relatively simple, while others are highly sophisticated networks who are able to outwit law enforcement agents. Paul Radu, who worked undercover to expose sexual slavery in Romania, made this distinction at the panel. In low-level human trafficking, the crime is committed as a standalone phenomenon. But more often, trafficking networks are often involved in bigger crimes. 8. In Brazil, some civil construction companies have been complicit in human trafficking. One panelist, Natalie Suzuki, cited cases such as one involving the country’s leading construction company, Odebrecht. 9. Very often, only low-level players in trafficking networks get arrested. Daniela Pastrana noted that the big players within human trafficking networks seldom get caught in Mexico because they do not make direct transactions, instead leaving those to their subordinates. Selase Kove-Seyram is a Ghanaian documentary filmmaker, photographer and freelance journalist covering West Africa. He is a member of the production team of Africa Investigates – an investigative documentary series on Al Jazeera. Last year, he reported on the OUTLAW Ocean series with the New York Times as a videographer/photographer. He also directed Ghana in the Eyes of God – a two-year undercover investigative by undercover reporter, Anas Aremeyaw Anas in 2015. The documentary exposed massive corruption in the Ghanaian judiciary.